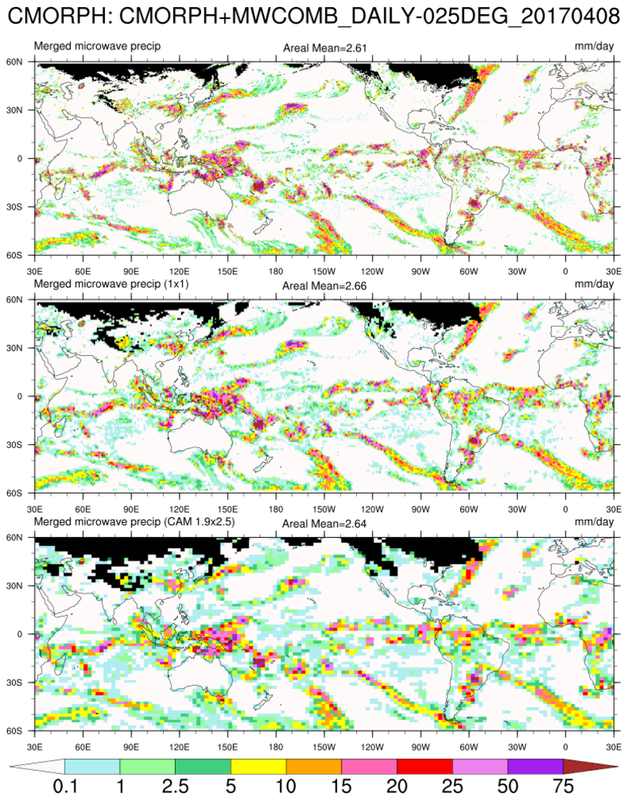 Several high resolution precipitation datasets have beome available. These datasets should be viewed as experimental. 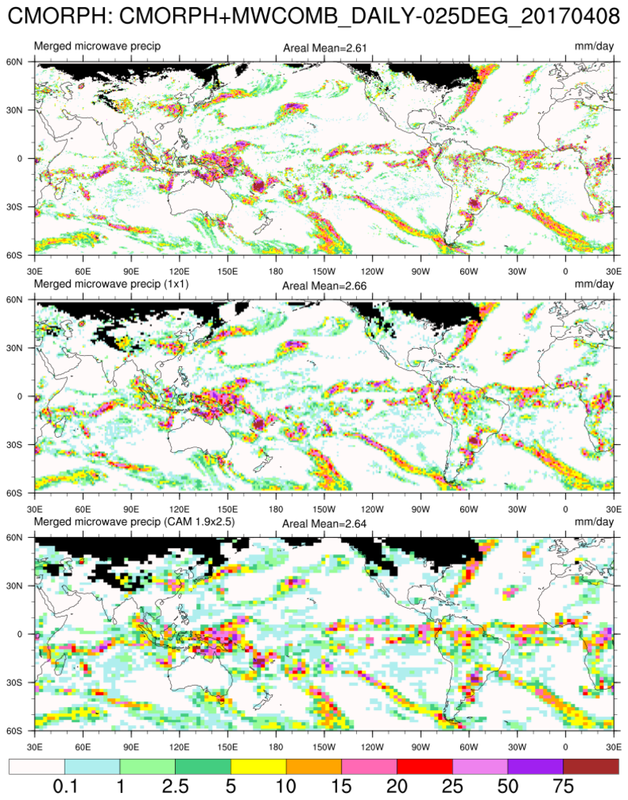 The three datasets included in this suite of examples are all freely available. Some are in binary format and others in HDF. 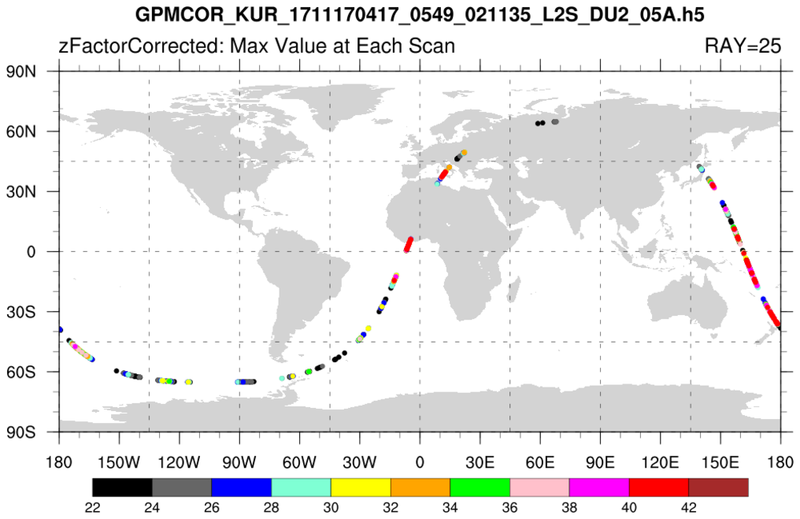 CMORPH: NOAA CPC Morphing Technique. Also, NCAR Research Data Archive. 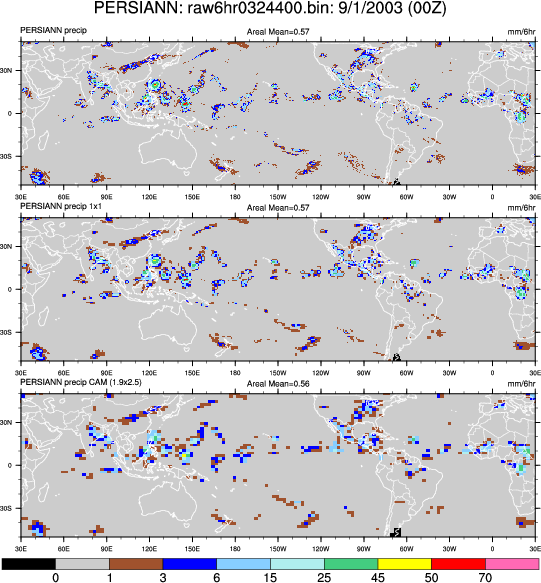 TRMM: Tropical Rainfall Measuring Mission. The TRMM ended 8 April 2015. It has been replaced by the GPM. 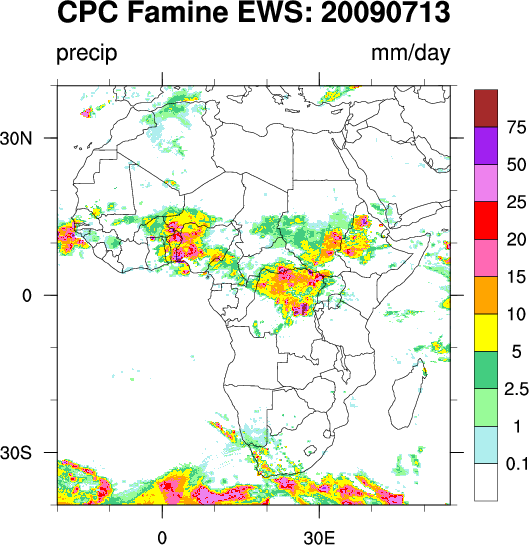 CPC Famine Early Warning System daily estimates (New_Algo). 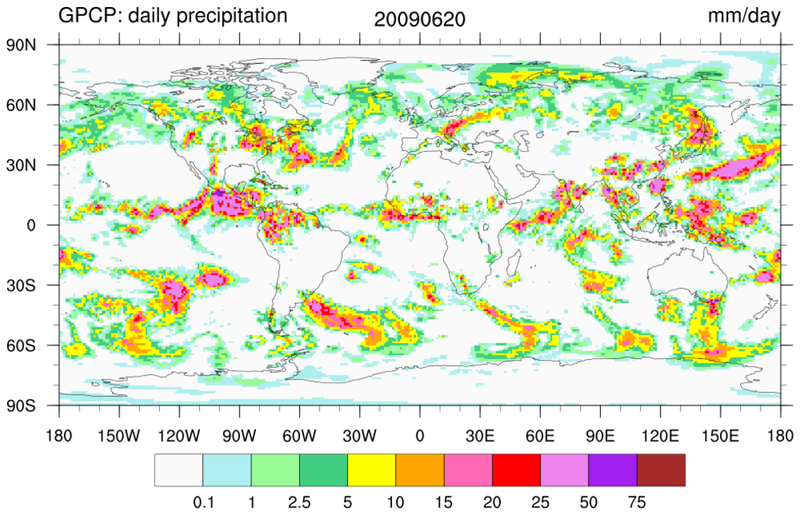 GPM: The Global Precipitation Measurement mission is an international network of satellites that provide the next-generation global observations of rain and snow. 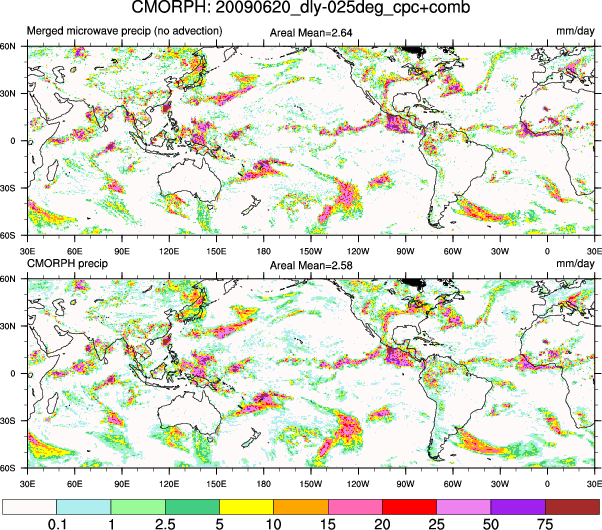 GPM is the global successor to TRMM. Generally, the examples below process only one file. To process multiple files would require only minor additions to the sample codes. Interpolating high spatial/temporal resolution precipitation fields, is best accomplished via area_conserve_remap or the ESMF software. Note: The area_hi2lores has been deprecated as of NCL Version 5.2.0. However, it is used here for backward compatibility. All of the basic interpolation functions have "_Wrap" versions which preserve and create appropriate meta data: area_conserve_remap_Wrap, linint2_Wrap, area_hi2lores_Wrap (deprecated). If netCDF creation is desired and file space is a concern, it may be best to "pack" the precipitation values. Using pack_values will create a file half the size of those created using float values. Some precision is lost but is not important here. Often, precipitation variables contain N-hourly accumulated totals, where N=1 or 3 or 6 or 12. A common question: Given hourly precipitation (eg, 0Z, 1Z, 2Z, ..., 23Z, 0Z, ...), how can (say) 6-hourly (0Z, 6Z, 12Z, 18Z) totals be calculated? Please see Example 5 of the dim_sum_n function. The CMORPH examples use the cnFillPalette resource introduced in NCL 6.1.0 (Oct 28, 2012). This facilitates associating different color schemes and contour levels. NOTE: There is one more color than there are contour levels. Subsequently, if different contour levels and colors are needed, the 'cnLevels' and 'cnFillPalette' resources would have to be deleted because the array sizes are different. NCL's := syntax, introduced in NCL 6.1.1 (Feb 2013) can be used. The GPM files are HDF5. These use 'groups' a new data structure for HDF. Climate Prediction Center's morphed estimates. Create netCDF. the resource lbBoxEndCapStyle to "TriangleBothEnds". 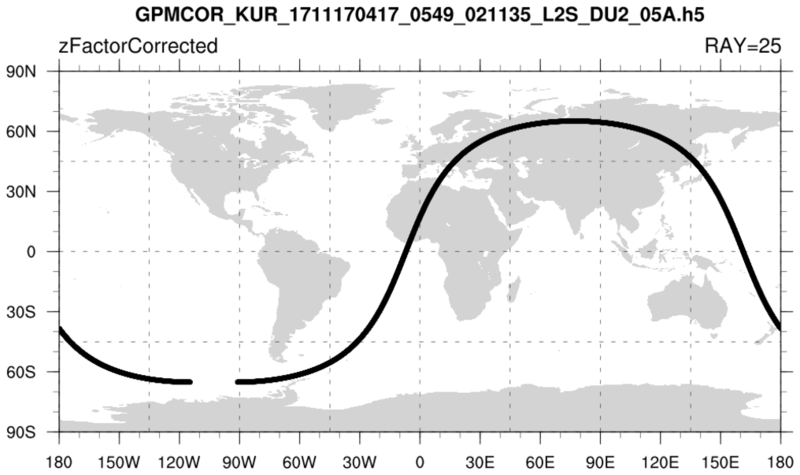 Read the 3-hourly CMORPH grids for one day: plot and create netCDF. using float values. Some precision is lost but is not important here. extent is 50N to 50S. Create packed netCDF. degree grid. Create packed netCDF. (a) Read one or more  binary file(s) [3000x9000]; (b) Explore data; (c) Increase workstation workspace; (d) Plot ; (e) Create netCDF-4." GPI,SSM/I and AMSU. Create netCDF. 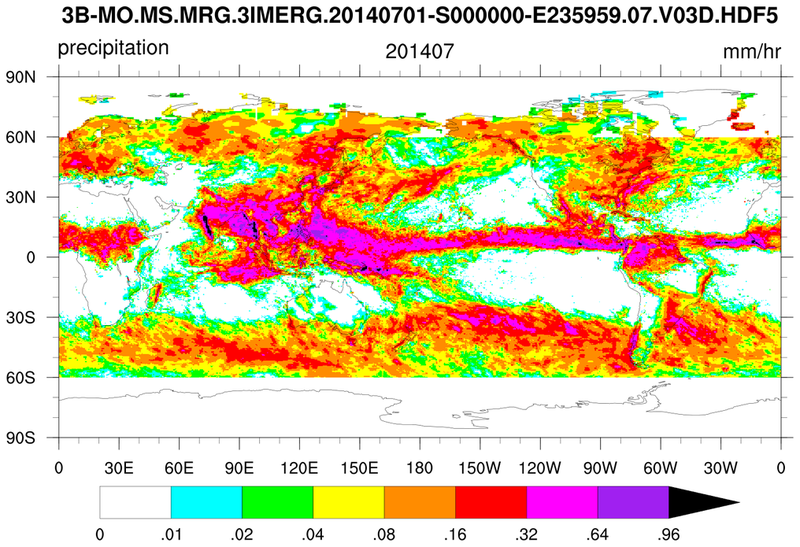 For this file, the areal average is 1.3 mm/day. The maximum value is 265.4 mm/day. 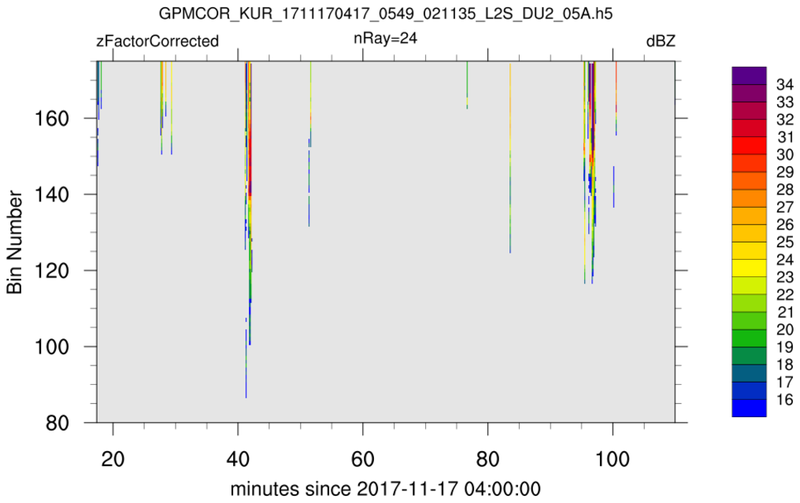 Plot GPCP-1DD for a user specified date. Read one or more CPC_Unified binary files. Optionally: (a) Create netCDF and/or (b) plot the data. executing the command via the system procedure. than this: 250, 300, etc. The script prints the min and max values for each file. 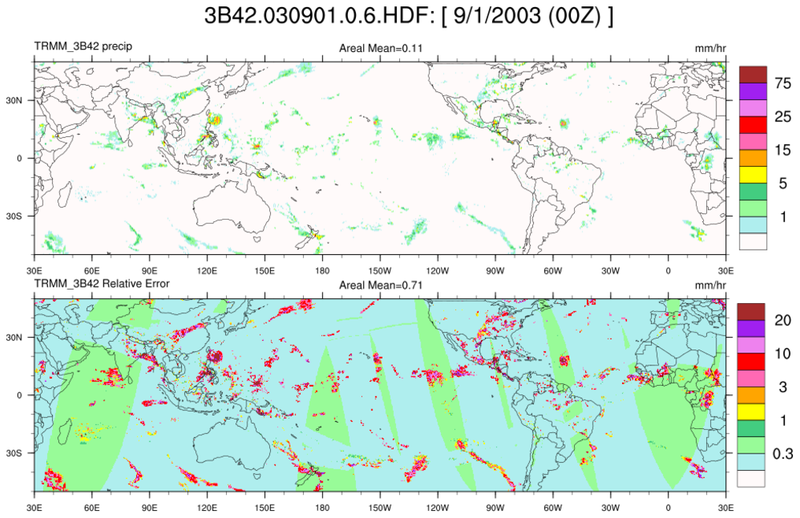 The HDF file is classifed as a "Scientific Data Set" [HDF-SDS]. a web site while the time is in the file name. variables of mixed types: type character, type short and type byte. and extract the appropriate information. The same record must be read for each type specification. Hence, the user must keep track of the byte counts. creates a netCDF file for each input binary file containing the unpacked values. values were set to _FillValue. contains additional information (time/date, lat/lon, reference). 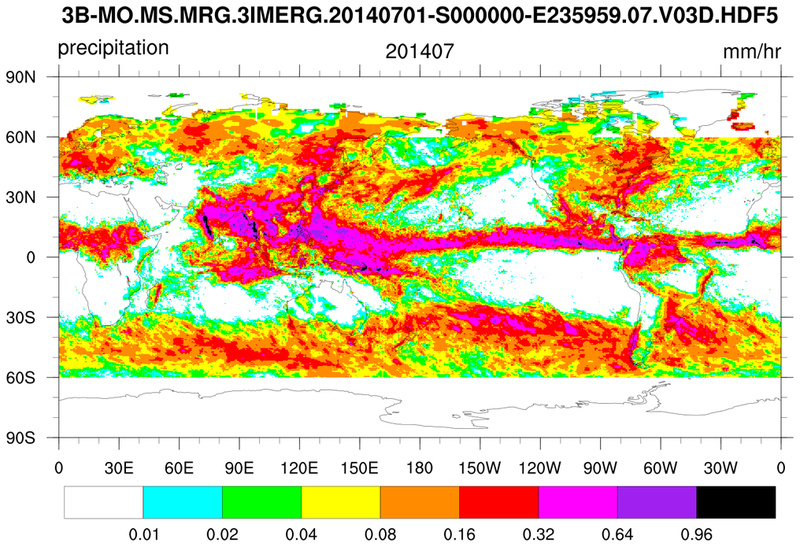 Read an APHRODITE netCDF file containing daily mean rain rates and create simple regional plot. which shows how NCL 'sees' the file is here. Note that the group variable '/Grid' has a preceding '/'. of using this resource to customize the labelbar. or you can select variables to subset and convert. For "thredds" you can use "NetcdfSubset" service to convert data to netcdf. Time-aggregation allows you to convert data in a time range into one file. Watch the time length for performance issues. 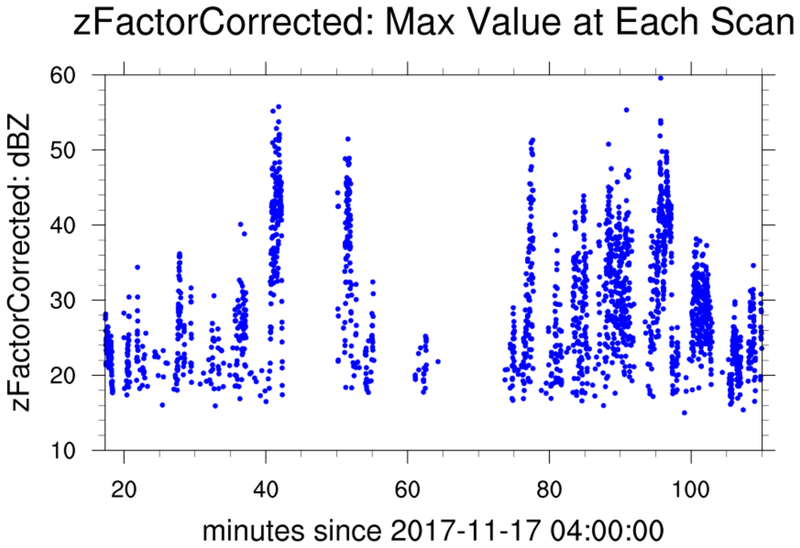 Each 'nscan' corresponds to a unique time. 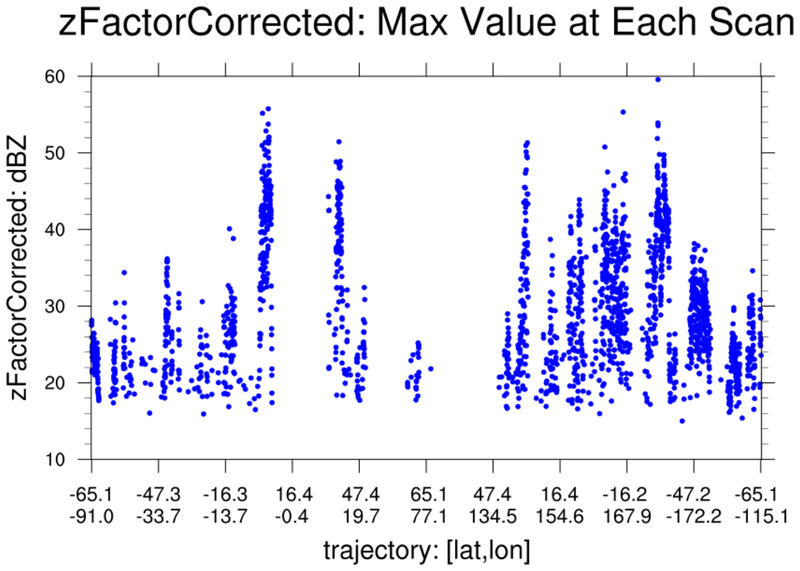 The nray represent 49 samples perpendicular to the trajectory. 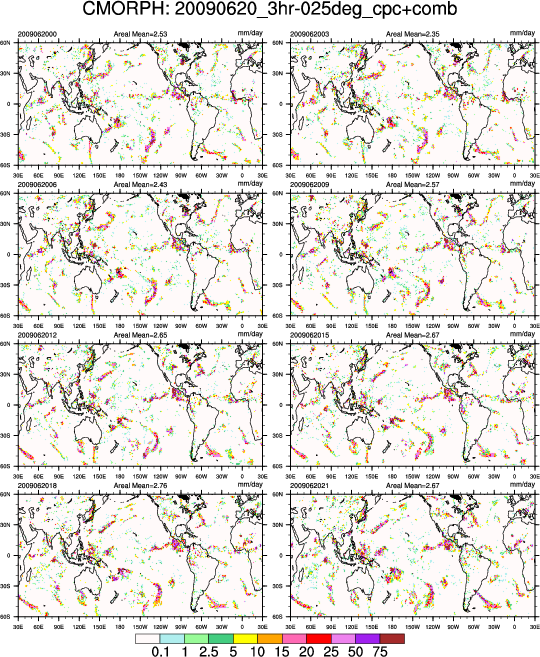 The nbin represent 176 vertical' samples at each scan and ray.. There are many missing values. Plot the trajectory data in different ways: (a) trajectory only; (b) polymarkers colored by the maximum value at each scan (time); (c) time series using polymarkers for maximum values at each time (scan); (d) same as (c) but plotting latitude and longitude as the abscissa; and, (e) plotting a contour cross-section. Create a CF-conforming time variable using cd_inv_calendar. Use nice_mnmxintvl and stat_dispersion to explore the data and set plot resources. 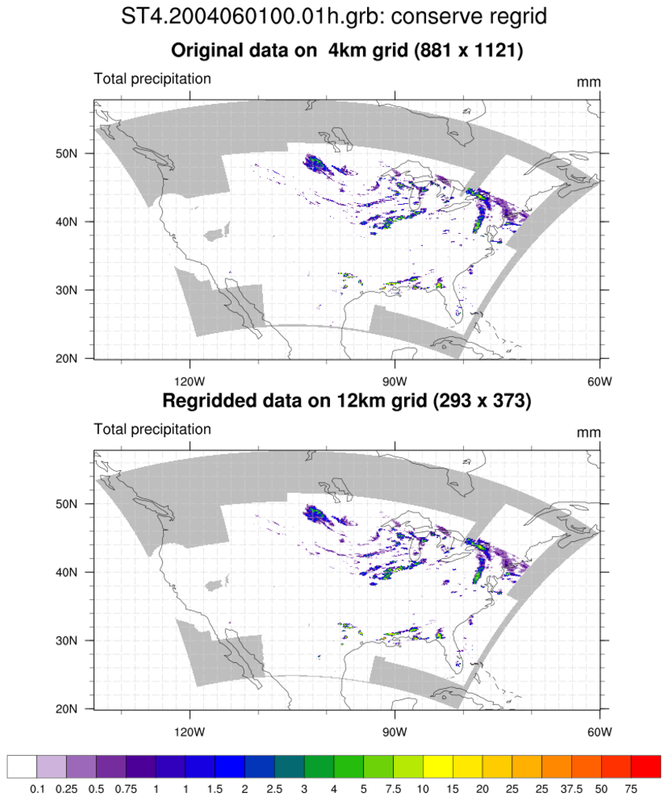 ST4_1.ncl: Read an NCEP Stage IV regional hourly/6-hourly multi-sensor (radar+gauges) precipitation analyses on a 4km grid. Plot and explicitly show grid locations with missing values (light gray). 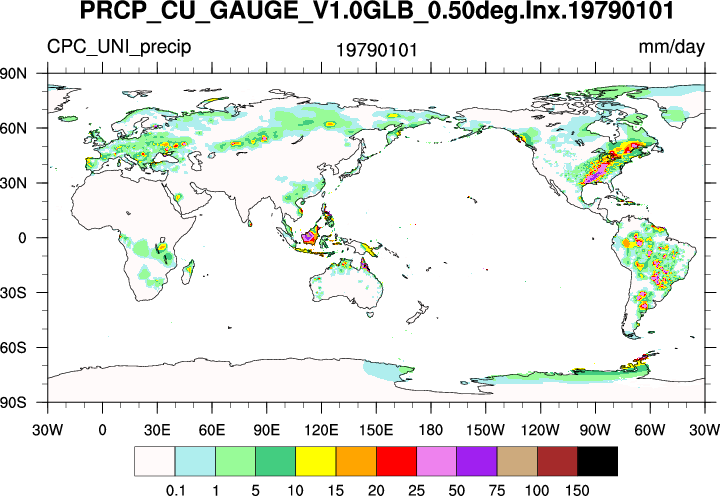 ST4_2.ncl: Read an NCEP Stage IV regional hourly/6-hourly multi-sensor (radar+gauges) precipitation analyses. Use ESMF conservative interpolation to regrid from 4km resolution to 12km resolution. Plot and explicitly show grid locations with missing values (light gray).